Quick and simple-to-administer is how Journal of Hand Therapy has described this dexterity test. 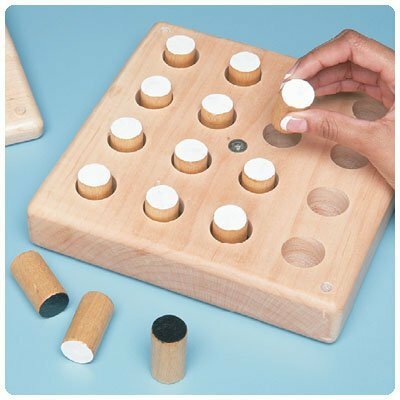 Small and portable, it involves turning pegs over as quickly as possible using the non-injured hand, followed by a timed test of each hand. The ÒTime OnlyÓ score quantifies the speed and the "Time plus Penalty" score quantifies the quality of the performance. Includes a Functional Level Score Sheet based on hand dominance and normal speed performing activities using a three-jaw chuck prehension pattern. Hardwood pegboard measures 8" (21cm) square with a locking cover. Each of the 16 wooden pegs is 7/8" x 1-5/8" (22mm x 4.1cm). Takes less than two minutes to administer, accommodating both a child's attention span and a busy clinic setting.